Theater, Dance, Music, & Good Beer ! You do not want to miss this! It is going to be an amazing show !! And a prayer for white snow this evening … in the spirit of yule ! A great way to stay fit, build strength, release stress, reconnect and balance energy. Explore your capacities. Heal. Breathe deep and relax. This is a loosely guided class beginning in and ending in circle. We will move through the elements of Earth, Air, Fire, Water. From the Beginning of time we have Danced. We have spun around the fires of humanity and moved to the beat of the earths pulse. We have sounded into the mystery and found ourselves in crevices of the ethers, shaking our bodies into the place where love has made its home. Movement is a language. It is a way to speak what is unspeakable. It is a way to communicate. It is a way to listen. Watch the way a child moves. Watch an infant wiggle. To Dance is in our bones. It is Ancient. We live in a culture that is constantly telling the individual what is acceptable culture and what is not acceptable culture. We live in a time that is craving a culture rooted in spiritual intelligence. When we release the inhibition and let go into our feet and bodies, we are creating a new culture. We come back to the old ways, in this new time. Remembering and Creating. This Dance is a Modality for Revelation. This movement is a path for healing. For Growth. For Deepening into the self. What to bring: Comfortable clothes, water, and a good dose of Curiosity. No Experience necessary! I hope that this time of summer has been one of Joy and Growth. The past couple of months for me have been an incredible transformation as I have moved through the rite of passage of motherhood and have begun the journey of this walk. In March i gave birth to a little boy named Raven, and through this birth i was re birthed into a new woman. I give thanks to so many of you for all your support through this time of change. And for the change you are moving through in your own life in this moment. I have been inspired to Co-host another dance retreat, themed SERVICE. How to stand in the path of mastery ,hone our gifts and bring them back to a place of service. One of my teachers would often say that a true master IS Service. As said in the the path of the Bodhisattva, On behalf of all sentient beings i do this work. This Retreat is devoted to the language of movement. To watch what arises as we dance. The body speaks a language of its own, and many of us do not take the time to listen and learn that language. If you feel inspired to attend this amazing day, be in your body, be in community and dive deep, COME. If you want to come but cost is an issue please fire an email my way as we are happy to work something out. This said may you sit in the seat of your abundance!! Dance and it shall be revealed. This August we will be participating in a powerful day of transformation and Growth. Get strong and Healthy. Using Rhythm, Movement and Sound, Explore and investigate body and spirit. Led by a host of skilled facilitators and Musicians, We will dance, we will move, we will take a powerful journey together. 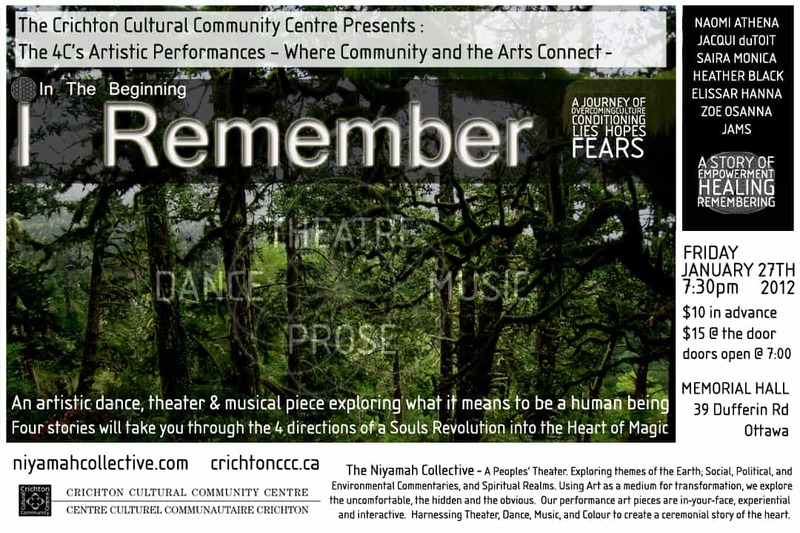 Taking place at the incredible sonic gym, on beautiful forested Land only 20 minutes from Ottawa.Deforestation, political upheaval, war, tsunamis: When we tune into our family here and around the globe, we can become overwhelmed and feel helpless, become apathetic or shut down. Knowing that we are all connected, that we are all one people, how can we offer to the world at large with who we are? Be bold and courageous, Express our truth, Walk in community, express boundaries and stride in Love.The theme for this Retreat is SERVICE- how can we step into our own personal Mastery, hone our gifts, and bring them back into a place of service. We will dance this, dive into this and explore what arises. $ 80 Early Bird Tickets or $95 at the door. Tickets sold at Serendipity Books and Singing Pebbles~ easy online payment option coming up soon! This June, a group of local artists created an interactive art piece called I AM, coming into the essence of what I AM is in all of us, we had one of the most beautiful evenings imaginable. Due to so many requests for another Show, we are performing this piece ONE more time at the Dunrobin Sonic Gym. This piece is exploring various themes of the feminine. All written and directed by Female Artists. It is exploring the voice of woman. Through Color, Monologues, Prayer, Paint, Dance, Rites of Passage, The Sacred, The Profane, the Divine we journey. I wanted to invite you all to this evening of Dance, Music, Theater, and Poetry all sharing beautiful stories of hope.